1.4 A TYPICAL GRINDING PROCESS . 2. 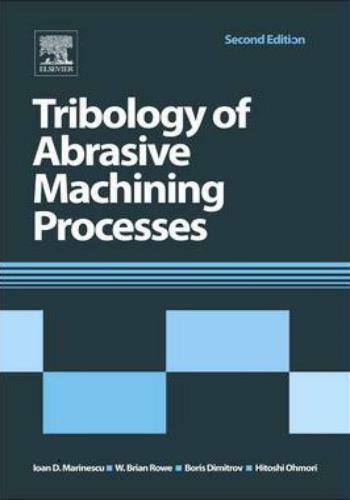 Tribosystems of Abrasive Machining Processes . 2.2.3 Interrelationships Between System Elements . 2.3.1 Bonded Abrasive Processes . 3. Kinematic Models of Abrasive Contacts . 3.1.3 Volume Tool Wear . 3.2 BASIC ANALYSIS OF SURFACE GRINDING . 3.3 CYLINDRICAL GRINDING CONTACTS . 3.3.1 External Cylindrical Plunge Grinding . 3.4.4 Equivalent Chip Thickness . 3.4.8 Effects on Grain Wear . 3.4.10 Irregular Grain Depth . 4.2.3 Combined Deflection and Depth of Cut . 4.3 SMOOTH BODY ANALYSIS . 4.4 ROUGH SURFACE ANALYSIS . OF ROUGHNESS FACTOR (Rr) . 4.5.2 Effect of Depth of Cut . 4.6 ELASTIC STRESSES DUE TO ABRASION . 5.2 FORCES AND POWER . 5.3 FORCES: SPECIFIC ENERGY AND EFFICIENCY. 5.5 THE SIZE EFFECT . 5.5.1 The Sliced Bread Analogy . 5.5.2 Cutting, Ploughing, and Rubbing . 5.5.3 Threshold Force for Cutting . 5.6.1 Chip Formation Energy . 5.8 EFFECT OF DRESSING TOOL WEAR . 5.9 THE NATURE OF THE GRINDING FORCES . 5.10 FORCE RATIO AND FRICTION COEFFICIENT . 5.10.3 Combined Cone and Sphere Model . 5.12 SLIP-LINE FIELD SOLUTIONS . 5.12.2 Wave Removal Model of Wear . 5.12.3 Chip Removal Models of Abrasion . 6. Thermal Design of Processes . 6.2 EXAMPLES OF SURFACE DAMAGE . 6.2.7 Mechanically Induced Stresses . 6.5 TEMPERATURES IN GRINDING . 7.4.3 Machining of Ductile, Polycrystalline Materials. 7.4.4 Indenting a Brittle Semiconductor Material . 8.1 THE ROLE OF PROCESS FLUIDS . IN HIGH SPEED GRINDING . 8.3 NOZZLES FOR HIGH SPEED GRINDING . 8.3.1 The Turbulent Orifice Nozzle . 8.4.1 Velocity Requirement for a Jet Nozzle . 9.4 ELECTRICAL ASPECTS OF ELID GRINDING . IN GRINDING OF CERAMICS AND GLASSES . 9.9.2 ELID Duplex (Double-sided) Grinding . Vertical Rotary Surface Grinder . 9.9.7 ELID Grinding of Ceramic Coatings . 9.9.9 ELID Grinding of Microspherical Lens . 9.9.12 ELID Grinding of Hard Steels . 10. Grinding Wheel and Abrasive Topography . 10.1 BASIC WHEEL SHAPE . 10.3.1 Cutting Edge Dullness (?) . 10.4.3 Comparison of Measurement Ranges . 10.6 GRINDING INCONEL 718 . 11.2.4 Silicon Carbide (SiC) . 11.2.6 Abrasive Wheel Type-marking . 11.4.1 Structure of Diamond . 11.4.2 Structure of Cubic Boron Nitride (CBN) . 11.5.2 Modern Grain Developments . 11.5.9 Properties of CBN . 11.6.3 Bonds for Multilayer Diamond . 11.7.6 Design of High-speed Wheels . 11.8.1 Binders for Abrasive Pastes . 11.9.6 Abrasive Grains for Abrasive Belts . Grinding Wheel Manufacturers’ Literature . 12. Conditioning of Abrasive Wheels . 12.2 GRINDING WHEEL PREPARATION . 12.3 GRINDING WHEEL CONDITIONING . Diamond Tool Across the Wheel . 12.5.2 Diamond Roller Dressing .